Can you believe this is already the 61st week of blog challenges! This weeks challenge brings us a color challenge: Chocolate Chip, More Mustard, Old Olive, Ruby Red - you can add white of vanilla if needed. I know what your thinking - where's the black - I always use black in my cards - even just the slightest 1/16" border gives me what I need to make my main panel pop. Well, I did it - no black! I love the SCS SC 188 so I incorporated it into this weeks BC, but turned the sketch on it's side. If you'd like to play along with this weeks challenge, simply leave a link to your creation on this blog post, of if uploading to SCS, use keyword BC61. If you like Upsy Daisy, it's one of the stamp sets on sale for 15% off for the Never Before Seen Promotion, email me today to place your order. I'm also offering a Class Kit featuring the Upsy Daisy set. love how you did this. Very striking! I didn't get the memo that said we were supposed to use this set...lol. Your card is beautiful, as always Lisa. Your sketch is fabulous and it really focuses attention to you main image. Wonderful! Beautiful, Lisa. I love how the one flower is in Mustard - that's a great accent! Super job! GORGEOUS card! I love the little touches of colors here and there. Great Layout too! Love how that little pop of mustard really stands out! The distressing with this layout is perfect, too! THis is beautiful. Thanks for the inspiration. Oh I love how you used the sketch in this. Great card, great colours, great challenge! Very pretty, Lisa! I like how you made one flower stand out. Also, the grass is perfect behind this image. Perfect layout Lisa for this set. It really makes a strong focal statement. You are increasing my need for stamp sets with all these gorgeous floral samples you are posting! oooh....aaaah! Lisa this ethereal and impeccable! Lisa, these autumn colors are fabulous!!! Your card is gorgeous, I love how you inked the flowers. This is one of my must-have sets!!! I LOVE the sketch Lisa! And the finished card. I really like the one mustard flower...pops up! What a popular stamp set for this weeks challenge and each card is so unique. Great sketch and I love how you just highlighted one flower with the mustard color. 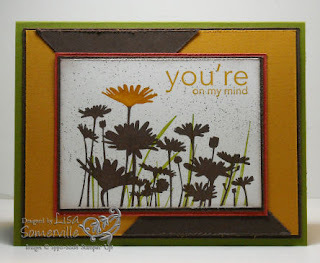 i love the way you showcased one fo the flowers....great card! Oohh Pretty! Love the layout you used. Beautiful card! I love this set!! This card is stunning. Upsy Daisy is one of my favorite stamp sets from the new catty. Great sketch too! Beautiful! The single mustard flower is so eye-catching. I just adore the mustard flower. This is great, I want my set, waaaa. Beautiful....wonderful.....gorgeous! Can you tell I love this card?!! I'm just dying to get my hands on this set...mine is finally coming tomorrow! !